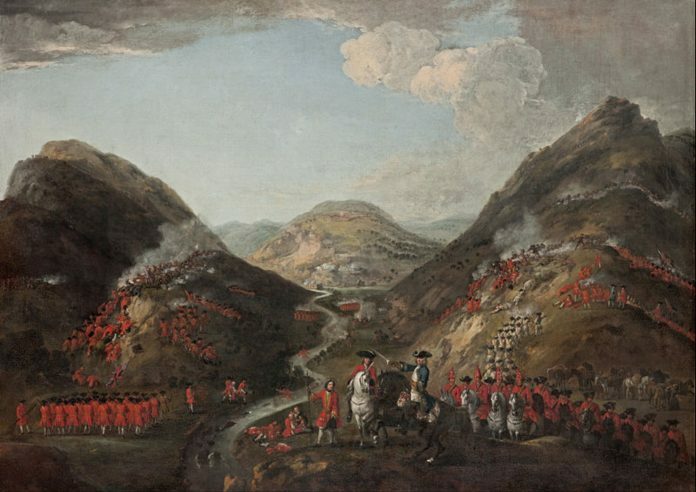 On 10 June 1719, Jacobite and Spanish forces are defeated by Government troops (mostly Scots), commanded by Major General Wightman, at the Battle of Glenshiel, on the steep slopes of Glen Shiel in Kintail, Scottish Highlands. Spain was at war with Great Britain, France, the Netherlands and Austria in The War of the Quadruple Alliance (1718–1720) and sought to organize an expedition to Britain involving some 7000 men to invade England and replace George I with James Stuart, with a diversionary force landing on the west coast of Scotland. The main invasion force of England was scattered in a storm and only 300 Spanish soldiers landed in Scotland at Loch Alsh. Following the battle, the Spanish surrendered. Their part in the battle is remembered by the name of a mountain overlooking the battle site, Sgurr nan Spainnteach, or “Peak of the Spaniards”.